Tango Weigela, weigela florida 'Tango', has both a compact, bushy habit and fantastic, purple foliage which makes this variety a must for a limited landscape. The flowers, a beautiful red with a yellow throat, bloom 3 to 4 weeks in June. Tango Weigela performs best in full sun. This moderate grower reaches 2-3 feet in height and width. 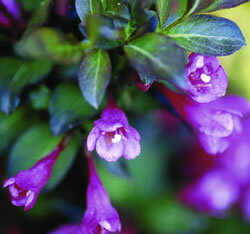 This compact weigela fits nicely into mixed shrub borders and at the back of perennial plantings. It even works well as a low hedge. Follow a regular watering schedule during the first growing season to establish a deep, extensive root system. For a tidy, neat appearance, shear to shape in early spring.